With the fall of autumn festivals are in the air. Lines of Puja and festivities come and go. This is the time of the year when we all come out of our regular routines and spend some time with family and friends. When it comes about enjoying with our near and dear ones, we just can not leave apart our sweet tooth. Sharing gifts and sweets are a main event of this festival season. 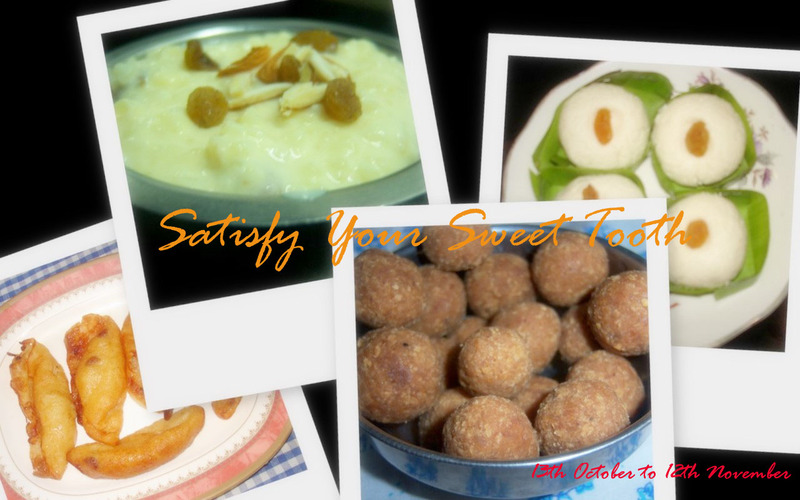 This event is to tickle that child inside us, who always want to indulge in sweet, never minding the calories we gain. Any dish that is sweet will be welcome for the event. Baked or cooked on flame, doesn’t matter as long as the food is sweet you are welcome to send in your entry. Anything that is sweet under the sun is welcome for this event. It may be cakes, pastries, sweet meats, kheer, payesam, or anything new that you come up with. I will be glad if you can add the link to this post along with the event logo on your post you are sending for this event. You can also send in you old posts with a link to this event. Those of you who don’t have a blog please attach your entry in a .doc file along with a photo of the recipe and send in to the above mentioned email id. All entries to be sent by the 12th of November, 2008 (IST). I always had a sweet corner for sweets. I used to devour sweets whenever I got the chance. I remember those days from school, I used to study at night and my mom always kept sweets loaded in the fridge. My way of taking a break from study was to get hold some sweets and have them. Those days are gone, and so are the streets of Kolkata, where you’ll find sweet shops on every road. I really miss every kind of sweet, be that the world famous rasogolla, or not that famous chanar sandesh. So, thought of taking up the task to myself; satiating my sweet tooth, preparing something straight from my kitchen. I was all set to prepare Mugh-daler-laddu. Everything was at place, all the ingredients, I had started making it too. Towards the end of my preparing it I got a call from my mom, adnd almost forgot that the oven was on. I jumped back smelling the burnt smells from kitchen, but everything gone. There was only a charred mass left out in the wok. In addition to this mess, I had to wash the utensil: that was really an awful experience. But, as usual I never loose heart. So the next day I again set up to prepare something sweet, this time it was not the same as the other day. I prepared chaler-payesh and wow, it was really awesome. Here is it for all of you. Today is janmasthami, there is Puja going at my home in Kolkata, again missing my family a lot. Neways this preparation is for my mom, and sending it to Festive Food Event hosted by Purva. Also sending it to Anisheetu’s SWC-Karntaka event. Living inBangalore for more than a year now Ijust couldn’t control myself to send this Bengali style Chaaler Payesh for the Karnataka food event, though the payesham is not much different from this paayesh. Boil the milk in very low flame, and let it condense till it become almost ¾ its original volume. Meanwhile, add ghee to rice and mix well. Drop in the rice when the milk is ready, and now cook on high flame, stirring often. As the rice gets cooked add sugar, green cardamom, bay leaf. Keep on flame till the sugar melts. Throw in the cashew nuts and raisins. Serve hot or refrigerate, as you like it. Garnish with raisins, almonds, cashew nuts or any other dry fruits of your choice. You can also leave out the ghee, but that does not allow the rice to stick to each other. The more you condense the milk, the better it tastes.